Sweet Sloops are sailboat-shaped chocolate-covered almond butter crunch. The almond butter crunch is covered in white chocolate and dipped in rich dark chocolate and pecans. Look closely and you'll see a mainsail and a jib of white chocolate floating in dark chocolate with pecan spindrift washing her sides. The name came about when the original Harbor Sweets candy maker�s son watched as the white chocolate was put on the triangular piece of almond butter crunch. �Sailboats�, he said. �Sweet Sloops�, we said. And the Sweet Fleet set sail. 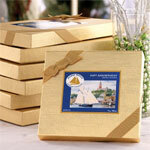 We provide a pair of sweet sloops in either a gold or white gift box. Each box contains two sweet sloops candies and weighs approximately 3 3/8 oz. Handmade in Massachusetts by Harbor Sweets. White chocolate (sugar, cocoa butter, whole milk, non-fat dry milk, milk fat, soya lecithin (an emulsifier), natural vanilla flavor), sugar, U.S. grade AA creamery butter, dark sweet chocolate (sugar, chocolate liquor, chocolate liquor processed with alkali, cocoa butter, butter fat, lecithin, vanilla), dry roasted almonds, crushed pecans, wildflower honey, lecithin, baking soda and salt. May contain traces of peanuts.